He was named after a well-known former American professional wrestler and is out to “tag” his trainer’s first Hawkesbury winner on Thursday. Exeter-based Sarah Murray-Leslie is looking forward to taking her three-year-old Stone Cold back to the Provincials to chase his fifth career victory in the Richmond Club Benchmark 69 Handicap (1000m). 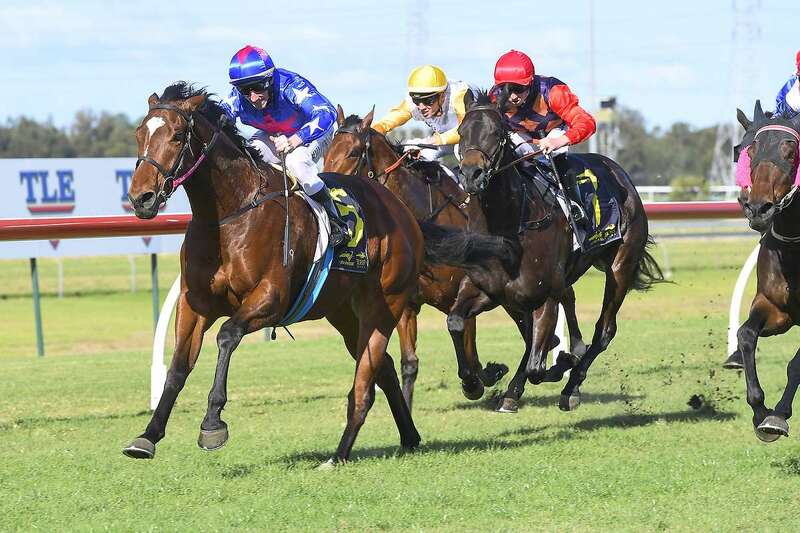 Murray-Leslie, who has had only a dozen or so starters at Hawkesbury to date for a minor placing, is confident the gelding can make it two wins from as many starts on the Provincial circuit. Stone Cold is unbeaten from both outings – in an 1100m Class 2 Handicap at Bathurst on June 3 and a Benchmark 68 Handicap (1000m) at his Provincial debut at Kembla Grange 13 days later – so far this preparation. Murray-Leslie this morning revealed how Stone Cold, a gelded son of Alert who has won four of his 18 starts, got his name. “My husband Ash Goulder has always been a big fan of American professional wrestling, especially the now retired ‘Stone Cold’ Steve Austin,” she explained. Murray-Leslie currently trains a team of five at Exeter in the Southern Highlands and takes her horses a couple of mornings a week to Goulburn racecourse (about 60km away) for pacework and gallops. While disappointed apprentice Billy Owen, who has partnered Stone Cold in his two latest victories, cannot ride him tomorrow as he has gone to Grafton for the carnival, she is pleased to finally secure the services of top jockey Corey Brown for the Hawkesbury assignment. Stone Cold’s name aside, there is also an interesting tale behind his breeding: “We bought his mother Yorked (by Foreplay) sight unseen from an Inglis sale for $400 and won seven races with her,” Murray-Leslie said. Coincidentally, Yorked was unplaced at her only her second start and the only time she raced at Hawkesbury in February 2011 (over the same 1000m Stone Cold will run tomorrow). Stone Cold is Yorked’s first foal, and the mare now also has a Toorak Toff yearling and is in foal to Royal Randwick and thrice Melbourne winner Odyssey Moon. Garry White, enjoying his best season in six years, hopes to improve on his 14 winners to date with four runners at the meeting and takes on Stone Cold with topweight Military Academy (Tye Angland). White is currently the leading local trainer at Hawkesbury meetings this season, having won nine races; one more than Scott Singleton. Lightly-raced Snitzel three-year-old Military Academy’s two wins have both been at home; in a 1100m Maiden on April 17 on good ground and a Benchmark 64 Handicap (1000m) on June 10 on a heavy surface. White has followed a similar path with Military Academy to the latest victory; trialling him at Randwick last Friday when a close second to Crimson Ticket over 745m. “He trialled really well and I expect him to be hard to beat again tomorrow,” White said. The trainer’s other representatives are Brown Thomas (1100m Clarendon Tavern Maiden Plate), Another Shadow (1000m Hawkesbury Gazette & Courier 3YO Maiden Handicap) and Redemption Road (1300m Schweppes Class 1 Handicap). Whilst Angland partners Military Academy, Stone Cold’s jockey Corey Brown has the mounts on White’s remaining trio. “Redemption Road has turned the corner at his last three starts since being gelded and also trialled well at Hawkesbury last week,” White said. White has decided to race rising three-year-old Brown Thomas without blinkers. “I put them on him earlier but don’t feel he needs them anymore,” he said. “He won a trial at Hawkesbury yesterday week without blinkers. Hawkesbury this morning was rated a“Soft 7 with a penetrometer reading of 5.31. A total of 24mls of rain has been recorded in the past week, but none in the last 24 hours. RACE 1: ERUDITION, Bobbing, I’m A Legend. RACE 2: EAGLEHAWK, Sugar Buzz, Magnifica. RACE 3: GOLDEN HITS, Another Shadow, Zoom Zoom. RACE 4: HAIKILI, Ballistica, Tell No Tales. RACE 5: STONE COLD, Military Academy, Unwise. RACE 6: GRAVITATE, Falcon Island, African Rainbow. RACE 7: ANGELO, Zidane, Redemption Road. RACE 8: RAKHISH, White Boots, Montevideo.